AprilAire 70 Pint crawl space dehumidifier. This Dehumidifier has digital controls. 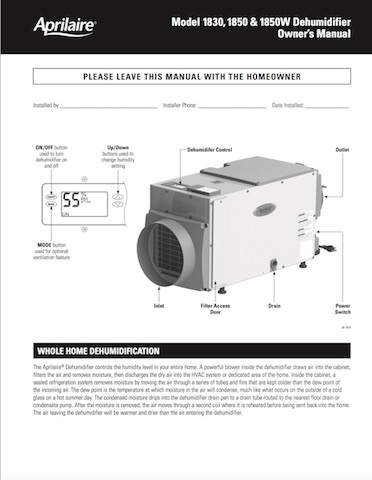 All Aprilaire dehumidifiers are 110–120 VAC. The current draw of the 1850 is 6.3 amps. No pans or buckets to drain! This dehumidifier can be routed to a sump pump or waste line. Digital controls and can operate from an optional remote panel. Larry really simplified a job that I thought was going to be a nightmare. At his suggestion, I encapsulated my crawl space with the 20 Mil SilverBack™ and added an AprilAire dehumidifier. Now I am one happy, satisfied customer because there is no more water running off ducting and I finally have a crawl space that is dry. This unit was installed in a 1000 SF bungalow style home built in 1908. The home had high a humidity issue in the basement. I mounted this unit on a metal cart/rack, plugged it into a standard wall outlet and fed the drain tube into a 5 gallon bucket which I empty by hand for now. I will install a condensate pump later and feed to a utility sink. After installing this unit, humidity levels dropped to 50% RH within about 24 hours. Regarding noise/ sound, I consider this unit to be very quiet. I would describe its sound level as similar to a refrigerator running. So far it has worked great, I hope to get many years of service out of this. Our new unit is currently installed and has been running for a week plus now in our newly encapsulated Crawlspace. The unit is extremely well built, quiet, and is pulling lots of moisture from under the house. We placed the discharge tube into a 5 gallon bucket outside our crawlspace. Every morning it is already overflowing so the unit is working well. We are very pleased with quality and the value we received. The mold remediation company wanted to charge $400 dollars more so we purchased the unit ourself. Thank you for the great deal and free shipping. The unit shipped the same day and arrived 3 days later. I will look forward to doing business again. Thank you!